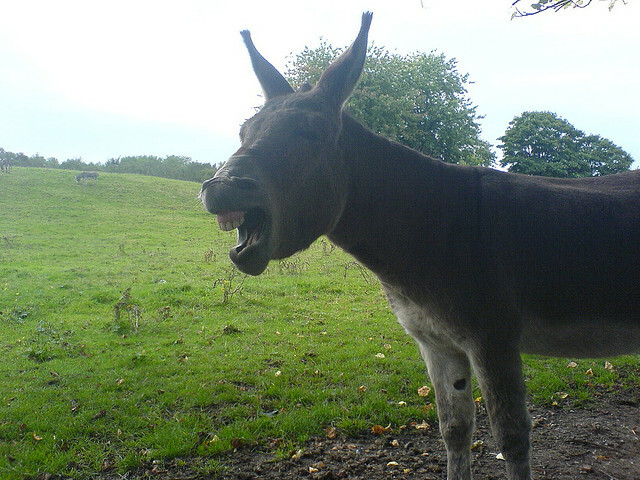 Did you know that donkeys are quite useful, intelligent animals? with smaller, more defenceless animals as a guard animal. Now I'm mad. This little tidbit gave me more of a jolt than my morning java. Bottom of The Chronicle Herald newspaper today: David Hendsbee, city councillor (Preston-Lawrencetown-Chezzetcook) has proposed the ability for the city to call a parking ban when there is the potential for bad weather, regardless of the time of year, to aid street cleanup. To quote the CH, quoting the councillor: "A parking ban should 'not be seen as only a wintertime application, but how can it be applied across all seasons,' Hendsbee said." Now I take issue with this. I do understand how it would help the city to be able to command all cars off the streets whenever they would like, BUT not everyone has a driveway to put their car in. I own my own house downtown—not in the suburbs as does Councillor Hendsbee—and do not have a driveway. I can only imagine the driveway he has, capable of parking, at the least, one full car. Luxury. Our block used to have a lane behind the houses which owners could use to access back yards for parking. Similar areas in the city still do. There's one just up the road. But our street has it no longer. Why, you ask? Because the city appropriated it and GAVE it to a developer so they could build an apartment building. So now not only do we not have access to park in our own back yards (thanks to our happy-give-lucky councillors from decades ago) but we have a 10-story brick monstrosity towering over our 2-story Victorians. It makes for great backyard use in the summer, what with all those windows looking down at you. This is an old scar, but it still itches. The apartment building has been standing since probably the early 1980s. Just like an old wound, when the weather turns cold the pain comes back. Every winter, starting the middle of December through to March 31, all of us on this block have go begging to that self-same apartment building to purchase indoor parking for the winter ban period. To add insult to injury, I couldn't GET any there this year. I have to park nearly two blocks away. Walk that in a driving storm, Mr. Hendsbee. In a glaring but typical oversight, the council at the time—even though they took away our parking ability—didn't build into the agreement with the developer that they would have to supply parking to the houses that the city "relieved" of theirs. I'm seeing red. Our parking, by the way, comes in at $103 per month. So the current parking ban costs us $360. Now wise Councillor Hendsbee wants to make it so that it's open-ended. Any time the city feels they can make the cars disappear. In essence, I would need 12 months a year parking. Quick calculation at current monthly rate: $1,236 per year. Of couse, we know that will go up. Indoor parking has increased every year I've had to purchase it. Does he think this will increase my property value? Probably. Staff has taken his suggestion "under advisement." Hopefully it ends up where most of the rest of Council's suggestions end up—file "G". This is one stupid idea that needs be nipped in the bud. Email, write or otherwise contact your councillor and voice your opinion on this matter. In fact, contact them all.